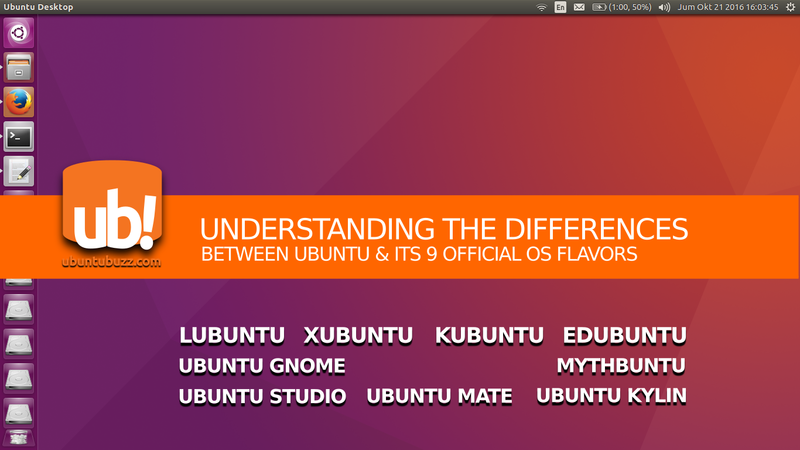 What Are The Differences Between Ubuntu Official Flavors? For most new users, the fact that there are more than 8 official "editions" of one Ubuntu operating system is hard to understand. It's particularly similar with Microsoft having some editions for Windows XP, and the users would ask "what are the differences?". This article mentions the differences of nine Ubuntu official "editions" (called flavors) based on the desktop interface, specific purpose, file manager, and LTS duration. This article also provides more information such as Wikipedia entries and other important resources to make it simpler to understand. I write this article in January 2017 and the number of flavors can be increased or decreased later. It's the operating system from Canonical, the "orange-pink oriented" one. It has desktop interface called Unity with unique and modern style. Ubuntu LTS version supported for 5 years. The file manager in Ubuntu is Nautilus (recently renamed as Files). This Ubuntu is not considered as flavor, it's the main product from Canonical. It's the derivative version of Ubuntu with desktop interface called KDE. It has modern look but with traditional style. Kubuntu LTS version supported for 3 years. The file manager in Kubuntu is Dolphin. It's official website is http://www.kubuntu.org. It's the derivative version of Ubuntu with desktop interface called LXDE. Lubuntu stands for LXDE + Ubuntu. Lubuntu is the most lightweight desktop operating system among the nine flavors, because it uses the high-speed energy-efficient LXDE desktop environment, and Lubuntu purpose is speed and energy efficiency. Lubuntu is highly recommended for reviving old or empowering low-resource computers. Lubuntu LTS version supported for 3 years.The file manager in Lubuntu is PCManFM. Lubuntu official website is http://lubuntu.net. It's the derivative version of Ubuntu with desktop interface called XFCE. Xubuntu stands for XFCE + Ubuntu. Xubuntu LTS version supported for 3 years. The file manager in Xubuntu is Thunar. Xubuntu official website is http://xubuntu.org. It's the derivative version of Ubuntu with specific aim for multimedia production. Ubuntu Studio brings many audio/video editor programs built-in, think of Windows with all Adobe Creative Suite programs, given to you free as in freedom & free as in price. The file manager in Ubuntu Studio is Thunar because it uses XFCE desktop. Ubuntu Studio official website is http://ubuntustudio.org. It's the derivative version of Ubuntu with desktop interface called MATE. Ubuntu MATE resembles the old Ubuntu before Unity (before 2011) while it used GNOME 2 (currently discontinued) desktop interface. MATE desktop is the continuation of GNOME 2. The file manager in Ubuntu MATE is Caja. Ubuntu MATE official website is http://ubuntu-mate.org. It's the derivative version of Ubuntu with desktop interface called GNOME 3. This desktop interface is modern, unique, touchscreen-oriented, and very different with the old GNOME 2 and the new Unity. The file manager in Ubuntu GNOME is Nautilus. Ubuntu GNOME official website is http://ubuntugnome.org. It's the derivative version of Ubuntu with Unity desktop interface and a whole Chinese language. Ubuntu Kylin is designed specifically for Chinese users. The file manager in Ubuntu Kylin is Nautilus. Ubuntu Kylin official website is http://www.ubuntukylin.com. It's the derivative version of Ubuntu with Unity desktop interface with specific aim for education. Edubuntu stands for Education + Ubuntu. Edubuntu is a special GNU/Linux for schools and kids. Edubuntu supports LTSP by default, and includes Epoptes (class/lab management system). The file manager in Edubuntu is Nautilus. Edubuntu official website is http://www.edubuntu.org. It's the derivative version of Ubuntu with specific aim for home entertainment system (TV show recording, home theater, playing audio, etc.). Mythbuntu name stands for MythTV + Ubuntu. MythTV itself is a free software aimed for digital video recording (DVR). Mythbuntu ships with only DVR and it's multimedia related software, excluding LibreOffice and Thunderbird for example. Mythbuntu LTS supported for 3 years. The file manager in Mythbuntu is Thunar, because Mythbuntu uses XFCE desktop. Mythbuntu official website is http://www.mythbuntu.org.